The Alligator Sinensis Nature Reserve is part of the Tentative list of China in order to qualify for inclusion in the World Heritage List. 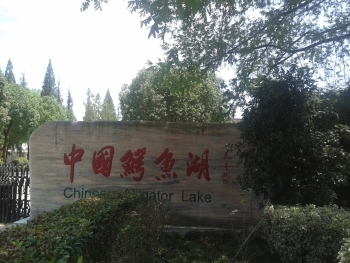 The alligator lake is in the town of Xuancheng, or rather just at the outskirts of. There are fast trains from Hangzhou/Shanghai and possibly even Nanjing for easy access and this place easily combined with all the WHS around the east coast area if you have that extra day available. There is a bus from the city center around every half and hour directly to the front door of the park - and as terminal station it is hard to miss. Once you get there it should be rather empty. The lake and breeding pools are not very big. Be careful taking kids along because the pools do not have barriers. Most of these guys will just relax in the water but you can catch some moving around and even eating. Overall there is not much to see. You can pose with the alligator for a picture - not sure how safe it is but the pictures make it appear that they do not bite. Crazy? There are some information panels. Walk around the entire thing in half an hour, maybe 1 hour max, and take the bus back to town. I am guessing the universal value is for preserving this species of alligator - but honestly I would rather not see "zoos" popping up as WHS here and there, as much as the effort is appreciated.